Having spent a significant amount of my career delivering complex projects, driving innovation and building teams I find that large companies continue to struggle to quickly innovate and get the most productivity out of their teams. Why is there a company like Netflix when there is HBO or MongoDB and Cassandra when Oracle exists? What is even more puzzling, why couldn’t Yahoo or AOL create Facebook with Yahoo 360 or the News Corporation with its acquisition of MySpace, instead both losing out to a 20-year-old kid from Harvard? There is so much innovation these days coming from very small teams with little to know cash flow. The logic behind this is fairly simple, their own motivation drives them to success and rules that govern many organizations either don’t exist or are broken intentionally. There are several reasons why startups currently drive so much innovation. They are nimble, quick to react, and adapt quickly to change. Team size is an important factor in this innovation. Smaller teams comprised of a blend of skills are often capable of collaborating more effectively than are larger teams. This is hardly a new concept, but just how larger organizations can simulate small team dynamics continues to be an open question. Fortunately, a tight-knit company culture can be attained within larger agencies. As teams grow, hierarchies tend to proliferate, and as a result, teams develop unnecessary complexity. The more degrees of involvement and approval an undertaking must face, the greater the threat that the undertaking may be watered down or held back. Additionally, from a personal standpoint, large groups are more likely to foster communication breakdowns and interpersonal problems. Amazon CEO Jeff Bezos has publicized his “pizza” rule: if a team can’t be fed with two pizzas, it’s too large. Small groups have produced a number of the world’s hottest technologies. For example, the IBM AS400, one of the IBM’s most successful products, was built by a very small team comprised of only a handful of people. VisiCalc, the original spreadsheet that, as tech historian Benj Edwards recounts, “Computer science is no more about computers than astronomy is about telescopes.” when it launched in 1979, was developed with the aid of only two individuals. However, small teams don’t merely increase technological improvements, but also encourage collaboration through frequent communication, as the communication barriers between individuals are smaller and less complex. With a smaller team, managers can carefully handpick the right people for the job. Putting together a group with the proper set of capabilities and combination of personalities is of utmost importance. These factors impact not only how the team works collectively, but also what the team produces. The two most essential elements I seek in prospective employees are tech expertise and a complementary talent set, as well as employees who are also mutually respectful of each other’s unique know-how. In a bigger group, voices often dissent, and the team often lacks a common sense of direction. Easier communication is one of the utmost benefits of a smaller team. Additionally, it is critical that the team define the roles and obligations of each member so that each individual has the opportunity to play to his or her strengths in a manner that also serves the team’s goals. As organizations attempt to stay agile and inventive, many have discovered that a team of five to seven people is the natural size for maximum performance. This is the best number for leadership teams, product teams, research teams, design teams, and more that are most likely to produce the very best productivity, the shortest timetable, and the best value producing the best possible results. In many organizations, small teams are beating out their clumsily overpopulated counterparts because they work well even at the very highest levels. For instance, FedEx—a large and complex company—has reduced its core leadership team to CEO Fred Smith and his ten direct reports. This small(er) team size helps the company to provide a single face to customers and shareholders. Several years ago, the German software company SAP changed the administrative framework of its 20,000-person development department and reorganized it into “mini-teams” of approximately ten people. Each team had the competency and jurisdiction to make the decisions necessary to complete the whole product development cycle, including the quality, performance, and constructive blueprint of the product. As a result, the product development time was cut in half over a three-year period. That’s the power of setting aside the need to micromanage and letting small teams fail. On their own, these mini-teams became amazingly ambitious and found a faster, better management methodology than that provided by corporate. Certainly, some projects demand large teams, but the productivity that a Project Manager obtains from each member on the team declines as the team grows, and for this reason, it is often in the best interest of the project to keep the team size as small as possible. Discovering the “sweet-spot” at which individual productivity and group productivity are at their peak is the hallmark of a great Project Manager. When a team becomes too large, fitting in and agreeing become more important to team members than standing out and offering a practical and project-driven assessment of team needs. On a large team, team members may become lost in the system or left out of the conversation, and these factors may lead to a decline in the team’s overall productivity. A team of five to seven people is generally considered to be of optimal size. It is true that in a team of this size, the disjunction of labor is possible, but active conversation between team members remains an important advantage. Each team member has the opportunity to directly converse with other team members. Also, team members have a better sense of the importance and value of their own role within the team and will likely see their input to the project as impactful. Even on smaller teams, it’s likely that members will have various training, education, and experience levels, as well as various areas of expertise. The “two pizza” example is one of the best ways to teach the less experienced team members. Much of the on-the-job training will occur naturally as team members work together and interact over the course of the project. This promotes teamwork and comradery, and the company is able to offer training to junior associates without allocating any extra resources. In small teams, each team member must contribute to the project. There’s no room for dysfunction or old boys’ club politics. When each team member’s neck is on the line, it’s in everyone’s best interest to listen to all feedback and to back the best ideas. On the other hand, we have all seen large teams devolve into unproductive hierarchy. 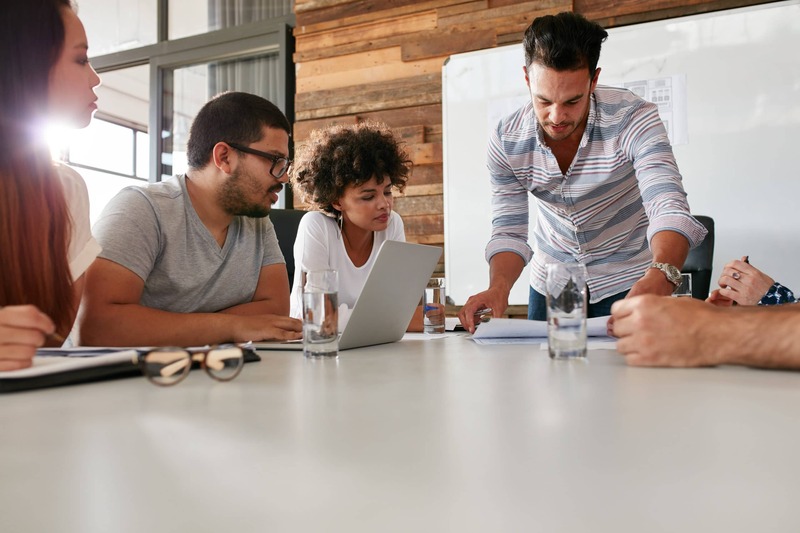 These groups do not only constrain progress but can seriously poison your corporate culture and foster disconnection between team members, as some position themselves as higher than others in the corporate hierarchy. Remember—hardworking and hungry is always better than fat and comfortable. Yes, it may take a lot of work to shift to “two-pizza” teams if your organization is currently congested by overpopulated conference tables, and you may run into challenges along the way. But you’ll find that the effort is worth it—small and highly-productive teams are the high-performance approach of the 21st century.